Rotorua International Restaurants are a pretty good bunch. You can get a bit of everything in the wealth of eateries along Tutanekai Street. The high end restaurants by the lake also cater for an international range of cuisines. 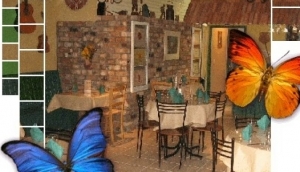 International Restaurants in Rotorua will surprise and delight you. Rotoruans take pride in the choice of cuisines they're able to offer in this surprisingly small city. You can get everything from American classic dishes in Rotorua's pubs, sizzling Mexicana along Tutanekai and Fenton Streets, and some mix-and-match fusion experiments going on in the south, in the large hotels of Whakarewarewa, near the Thermal Valley. If you're staying in the centre of town, wander over to Eruera Street and Amohia Street, for a good concentration of different world cuisines. The upmarket Regent Room serves an international and Pacific fusion menu which includes plates & tapas for sharing, along with a selection of desserts & cheeses..